The exclusive idol of Shiva is designed in a sitting position. Crafted meticulously with silver vacuum plating on resin, the idol can be installed at a place of worship at home or office. The detailing is flawless and precise, making the idol a must-have. The exclusive idol of Shiva is designed in a sitting position. 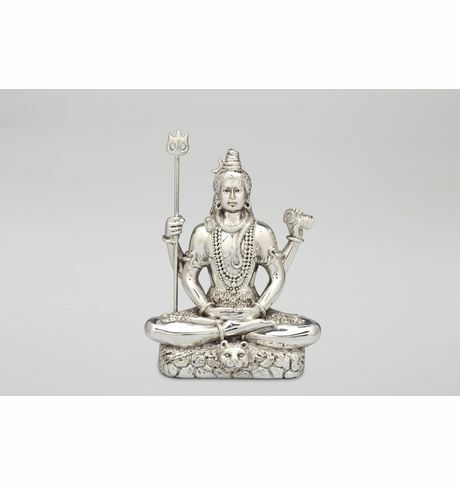 Crafted meticulously with silver vacuum plating on resin, the idol can be installed at a place of worship at home or office. The detailing is flawless and precise, making the idol a must-have. Silver Vacuum Plated Base Material: Resin Finish: Antique Color: Silver. Easy to maintain.Cancellation and Return Policy: • Exchange allowed post booking • No order cancellation or Refund transaction allowed at the store.